After a brief flashback, Alejandro G. Iñárritu’s Best Picture Oscar nominee The Revenant opens with a 10-minute scene that sets the stage both for the kind of story the movie is going to tell, and how Iñárritu’s going to tell it. The director and his cinematographer Emmanuel Lubezki move the camera slowly through a flooded patch of woodland, where water rushes around tall trees. There, tracker Hugh Glass (played by Leonardo DiCaprio) hunts for big game. Nearby, Captain Andrew Henry (Domhnall Gleeson) supervises a party of trappers as they load up their pelts and prepare to decamp to the fur company’s distant Dakota outpost, Fort Kiowa. The gliding shots, the mumbly conversations, and the lack of any real set-up makes The Revenant at first feel like an art film… something like Terrence Malick’s The New World or The Tree Of Life, both of which were shot by Lubezki. But then Henry’s men are ambushed by raiders from a tribe of Ree, and what ensues is a Western battle scene like no other. Arrows and hatchet-wielding natives come rushing onto the screen, unseen until they strike. The closeness of the framing—focusing mainly on one or two people at a time—heightens the sense of being dropped into a melee, with no time to acclimate. The movie continues like this all the way to the end, breaking up otherwise placid Western tableaus with sudden, graphic violence, made all the more disorienting by how Iñárritu and Lubezki nearly always stay in close on their characters. The Revenant was shot partially in Alberta, doubling for the northern territories of Thomas Jefferson’s Louisiana Purchase. This is beautiful country, vast and unspoiled, with views that stretch on for miles when the weather’s clear. But the filmmakers resist the temptation to keep cutting to long shots of majestic scenery. For the most part, if people want to see the mountains and rivers in The Revenant, they’ll have to crane their necks and peer around the hairy men in heavy coats. Lubezki—or “Chivo,” as he’s known to Iñárritu, Alfonso Cuarón, and Guillermo Del Toro, his friends from the Mexican movie industry since the 1990s—won an Oscar two years ago for Cuarón’s Gravity, and then won again last year for Iñárritu’s Birdman. He’s long been one of the best cinematographers in the business, and his awards were overdue. But while it would be nice if someone else won the Oscar this year (like maybe Roger Deakins, who’s been nominated 13 times and shut out 13 times), Lubezki’s work on The Revenant is his best from the past three years. The marathon takes and flashy effects of Gravity and Birdman stand out more. 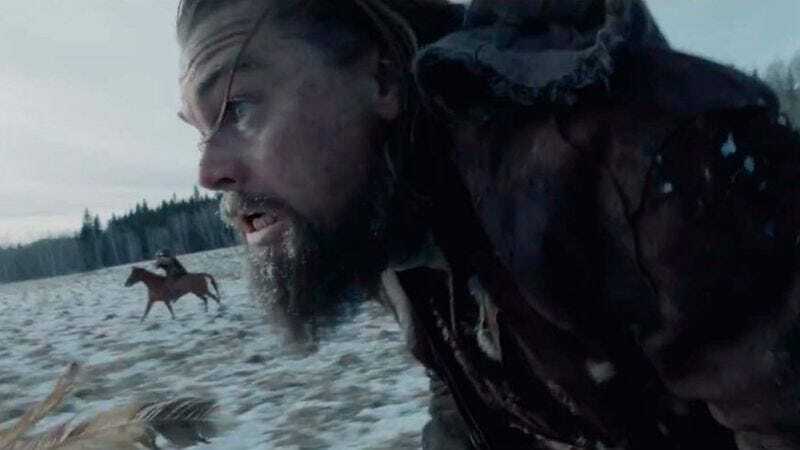 But in its own dogged way, The Revenant reimagines the look of an entire movie genre. It’s not that close-ups have been rare in Westerns through the decades, or even that Iñárritu and Lubezki’s “you are there” approach is wholly original. Hollywood movies about men and women braving dangerous frontiers have been regularly reinvented and revised over the past century-plus, evolving dramatically from the original simple stories of good guys and bad guys. Filmmakers have used the Western to comment on history, society, and what “good” and “bad” really mean. And they’ve done it by making the Western dirtier, weirder, funnier, artier, or more psychologically complex. There’s really not much in The Revenant that hasn’t been done before. But one of the constants in Westerns is the contrast between the small human figures and the landscapes that dwarf them. The Revenant has plenty of those shots too, particularly late in the film, when Hugh Glass is nearing Fort Kiowa—where he plans to wreak revenge on John Fitzgerald (Tom Hardy), the man who left him for dead on an icy mountain. A more common shot though is of Hugh awkwardly lying on the ground, with the camera at an askew angle right alongside him. He fills most of the frame, with just a little bit of light and scenery—semi-blurry—behind him. The effect is to make viewers more anxious about what they’re not seeing, just beyond the hazy edges of the screen. And that is fairly new for Westerns, which might indulge in that kind of extreme subjectivity for a scene or two, but rarely for the better part of two-and-a-half hours. Even though the characters have plenty of open land to spread out in, circumstances and careful choreography conspire to keep them bunched together. Usually it’s because they’re trying to avoid being picked off one-by-one by hostile natives, which early in the story means that that they have to cram themselves onto a small boat, floating slowly downriver. When the trappers move onto land, Iñárritu and Lubezki emphasize how arduous their journey is by placing the camera in what looks like impossible positions, making it so the actors effectively have to squeeze past the equipment as they climb and trudge through narrow passes. What’s largely missing from The Revenant are simple, position-defining medium shots, which establish where the actors are in relationship to each other and to the landscape. Even when the camera pulls back just a bit, Iñárritu often has some sort of object or animal in the extreme foreground, to reinforce the crowded, uncomfortable feeling. Just as often, Lubezki’s use of wide lenses leads to close shots where distant trees and hills look like they’re right on top of the characters—so much so that they’ve become indistinct masses of dark color, vaguely threatening. The Revenant really tells two connected stories, with a subplot—about a tribe’s search for their chief’s abducted daughter—that drives the action in ways the main characters don’t fully understand. The screenplay, by Iñárritu and Mark L. Smith, keeps the explanations to a minimum, though it’s never willfully obscure. It’s just that the film occasionally takes its time to get to some of its key narrative details. Fitzgerald’s the villain of the main story. He’s a selfish, greedy bigot, who pays lip-service to the notion of honor just to placate Captain Henry—who, in his own way, shirks his responsibility to his men by farming out the job of their protection to someone he doesn’t really trust. When Glass is mauled by a bear and proves to be a burden to transport, Fitzgerald agrees to stay behind with a small group that includes Glass’ half-native son Hawk, to see that their scout gets a proper burial when he inevitably dies. But Hugh stubbornly clings to life, so John kills Hawk and then tosses the boy’s father into a hastily filled-in hole. Fitzgerald’s journey back to Fort Kiowa—accompanied by a wary younger colleague, Jim Bridger (Will Poulter)—runs parallel to Glass’ gradual recovery from his wounds. Hardy’s character is frequently alone in the frame, friendless and scheming. Even when Bridger finds out the truth about why they abandoned Hugh, and pulls a rifle on his traveling companion, the camera doesn’t show Jim, but instead holds on a defiant Fitzgerald. Once again in The Revenant, the deadly threat’s kept just outside the frame. When the pair makes it back to Fort Kiowa, Fitzergald’s mainly concerned with getting paid for all his work, so that he can split the territory before his lies are exposed. Hardy plays the man as jumpy, and even in interior shots Iñárritu and Lubezki try to isolate him from his surroundings—by framing him in silhouette against a window, or putting a low-hanging candelabra between him and Captain Henry in the Fort’s canteen. All the while, the compositions make it look like the walls, ceilings, and fixtures of Kiowa are closing in on Fitzgerald. Most of The Revenant, though, is about Hugh Glass, who can barely talk because of his bear-damaged vocal cords—which gives DiCaprio, Iñárritu, Smith, and Lubezki the challenge of getting this struggle for survival and quest for revenge across almost exclusively via images and behavior. The Revenant is at its best in these scenes, which show Glass cauterizing his wounds, making fires with gunpowder, escaping hostiles by swimming through rapids, and catching fish with ingenious artificial dams. If DiCaprio wins the Best Actor Oscar for this film, it won’t just be because of the production’s brutal conditions, but because more than half of the picture consists of close-up shots of his character thinking his way out of jams. …but mostly they’re aiming for something raw and immediate, halfway between Werner Herzog and a supernatural thriller. Glass is frequently made to look like a lumbering monster, whether he’s literally crawling out of his grave or he’s emerging, stiff and bloody, from the ominous forest beside Fort Kiowa. The Revenant is more a good movie than a great one. Somewhere inside of its massive 156-minute frame there’s a leaner, less pretentious Western, more akin to the kind that Anthony Mann directed in the 1950s or Clint Eastwood did in the 1970s. At times it feels like Iñárritu made the film more ponderous to justify the cold, hard misery of the shoot—along with the reported $135 million price tag. Then again, Iñárritu is a heavy-handed filmmaker by nature. The bright-side view of The Revenant is that at least this material forced him to put his undeniable gifts as a visual stylist in service of life-or-death action sequences, where the operatic flourishes are more justified. Ultimately, the reasons why The Revenant will endure are twofold. The main one—and the reason why it’s been such a strong box office performer—is that it’s dotted with gripping, unforgettable set pieces. That opening attack is in the same league as the D-Day invasion sequence in Steven Spielberg’s Saving Private Ryan (albeit much shorter and smaller-scaled), and it’s matched later by the bear-fight, by Hugh’s watery narrow escape from a tiny shoreside cave, and by a horse chase that ends with animal and rider plummeting off a cliff. After that big fall though, the movie shifts into a stranger place for the next few minutes, as Glass is forced to gut his dead horse, strip naked, and climb into the carcass to stave off the life-threatening cold. The imagery in that sequence is among The Revenant’s most surreal and darkly compelling: a mix of overhead angles, extreme close-ups, and more lyrical long shots that capture the savage beauty of the moment, while suggesting a kind of rebirth. That’s the other reason why film buffs are likely to shrug off The Revenant’s faults in the decades to come—because of how it looks. The movie’s detractors may bring that back up as a cautionary tale, arguing (as some already have) that the wide angles and tight compositions are a gimmick that wears thin fast, and makes the entire picture feel “off.” But even the nay-sayers would find it hard to deny that The Revenant’s visual style is distinctive. Last year, Quentin Tarantino made his own Western, The Hateful Eight, with stunning 70mm Robert Richardson cinematography, and Ridley Scott made his own survivalist saga, The Martian, with DP Dariusz Wolski. Both are fairly classical in their approach: for the purpose of subversion in the former case, and for mainstream appeal in the latter. Iñárritu and Lubezki, meanwhile, ignored decades of tradition and proceeded—perhaps somewhat arrogantly—as though no one had ever told this kind of story in these kinds of locations before. They playacted as pioneers, and in the process made well-colonized territory feel like a new discovery.